Wait, Red Ash? Actual Red Ash news? Yes it would seem so. The Red Ash OVA has undergone a name change, reports The Mega Man Network. 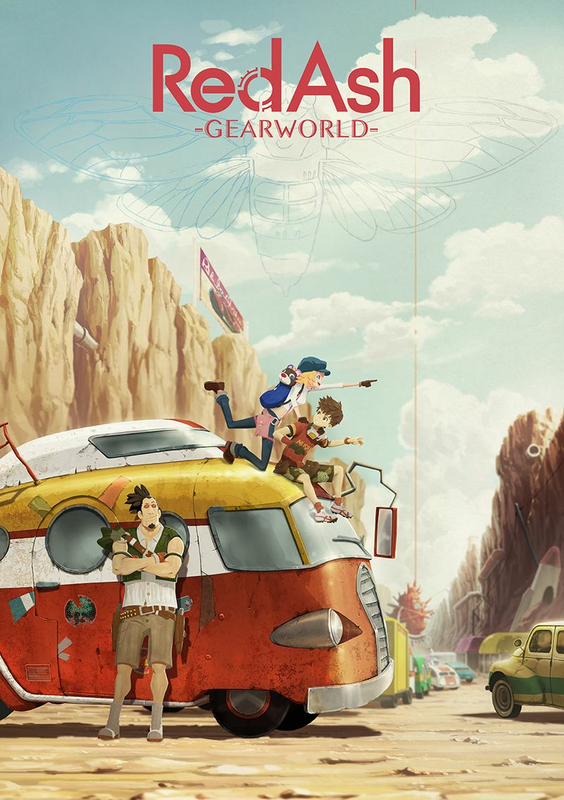 Red Ash -Magicicada- has been re-titled to Red Ash -Gearworld-. "In a future society where nanomachines have become incorporated into genes, the "Nano race" who possess special abilities are oppressed and discriminated against by the "Pure race" of normal humans. Among the Nano race is the young lad named Beck, a hunter of legend who possesses the special ability of "Red Ash" transformation. In order to pay for the costly operation that would allow him to become a member of the Pure race, Beck and his mechanic companion, a large but timid fellow named Tyger, have taken on dangerous work zipping to the old world in their Parallel Machine. Then one day, they suddenly cross paths with a young lady named Call who is being chased by Safari and Stripe, a mysterious pair of crooks. Thrust into a mixed-up situation, together they zoom off to Gearworld, but are pursued relentlessly by the shady duo and their leader Deny, who ultimately commence an attack on Beck and his companions...!" In Red Ash's world, humanity has been divided into two species: purebred humans like you and me and those with nanomachine-induced genetics. The latter gets all the cool stuff like special powers. As a trade-off, however, we treat them like crap. Head to TMMN for more details and speculation. It's good to see the anime moving forward, slow but steady. We're still very much in the dark when it comes to the game, though. I've got no news on that front. Glad to see the anime is still alive. It seems like it's only Comcept is being silent. Fangamer seems to be responding to Emails, Inti Creates are alive, and I was able to get into contact with Engine Software, the Developers of Mighty No. 9 3DS version (Who confirmed they are still being worked on, but couldn't go into details due to contract). Comcept really needs to speak up soon, their website doesn't seem to have been touched since October. Well, Comcept was speaking up with information on all of their current and future projects, and the result was that they got a lot of fan backlash for being too ambitious, scamming, etc. So I think that they are being very smart by just releasing statements as the need arises and keeping the critics in the dark. It works well for many other companies, and I commend them for having learned a lesson from their missteps and taking positive action to prevent future press debacles. Where did they speak up? I actually forgot Red Ash was a thing. Inafune is like an ex-husband. He's done wonderful things, but strains the trust of his loved ones. He creates good promises, but delivers poorly. When he made his biggest promise yet, he let everyone down. We all hate him now. I'm excited for this. I don't know why, but I am truly, genuinely excited. I'm not sure if I should forgive him for the sins of the past, but I'm willing to give Inafune my trust one more time. You know what? I almost don't want him to make Red Ash's game. If the anime turns out really well, I don't want him to destroy his newfound goodwill with another lackluster product. If it turns out to be the Legends successor we've been waiting for, then go right ahead. At this point, I'd rather just get all of his good projects than some of his failed ones. Not really. I don't hate him. He is just a human being. He made a mistake. So what. I don't hate him either, but I wouldn't say he made just one. I think it's safe to say that there's not nearly as many people that truly hate him, just don't see him as a gaming god that they once did (and/or just see him as a easy target to mock). It's a trust issue, and the only way for him to regain our trust is to made something great. It would be unfair to not allow him to even try. Nice. Good luck to Inafune on this anime and any related games. I can't wait to see the finished products. This is not bad news at all. It really is kind of a shame (in a way) that Red Ash was a doomed IP, but if it can continue on its own... preferably without rubbing Legends all over peoples' faces every five seconds... then that would be really great. "Red Ash was a doomed IP"
How do you come to that conclusion? Sure the Kickstarter didn't reach the funding goal, but I don't think that quite earns it a "doomed IP" label just yet. It hasn't even had its first product released so it's impossible at this point to measure the success or failure of the IP among average consumers. Actually, I would consider it a success so far because Comcept was able to successfully market the IP to an investor who saw value in the idea and decided to pony up the money to fund its production. I am cautiously optimistic for this.